Man’s best friend times 2. Ruff! Ruff! The sentence in this worksheet: Two dogs run and jump. 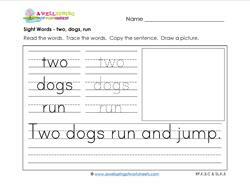 The sight words – two, dogs, run. Trace, write, and draw. Please go to this page to see all the sight words worksheets in this set.